Known as the Fireworks Capital of New England, Londonderry, New Hampshire is the best town around to go for fireworks for this year’s Fourth of July celebrations! That is, only if you’re looking to purchase some, not watch a fireworks display. Londonderry’s annual Fireworks fall at the end of the summer season, during it’s five day Old Home Day event. Currently, Londonderry is home to four (that’s right, four) Fireworks stores. In North Londonderry, just off of Rockingham Road before the Derry town line, you can find Atlas Fireworks. Atlas provides legal and heavy weight aerial devices, including Roman Candles, Jumping Jacks and the Atlas Grand Finale extreme party packs. Over 500 choices, at low prices! On the west side of I-93, just off of Exit 4, three other Fireworks stores are open for business. Both Alamo and Phantom Fireworks can be found on Londonderry Road. Phantom Fireworks offers Aerials, Novelties, Sparklers, Rockets, Safety Items and so much more! Alamo Fireworks provides smoke items, Roman Candles, Punks, Cake and Multi Effect items, and more. Also located off Exit 4 is the newest addition to the Londonderry Fireworks family. 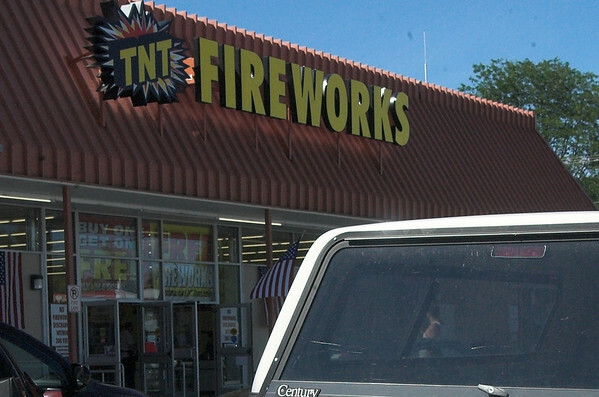 TNT Fireworks can now be found in the Derry Plaza just past the Shell Station on Nashua Road. Products offered at TNT include Fountains, Sparklers, Aerials, Rockets, and so many more! Just 45 minutes north of Boston and about 30 minutes south of Concord, Londonderry is a fireworks hot spot! Stop in today, and pick up a few rockets to blast off during your summer barbecue, or maybe just a few sparklers to hand over to the kids during someone else’s fireworks display!